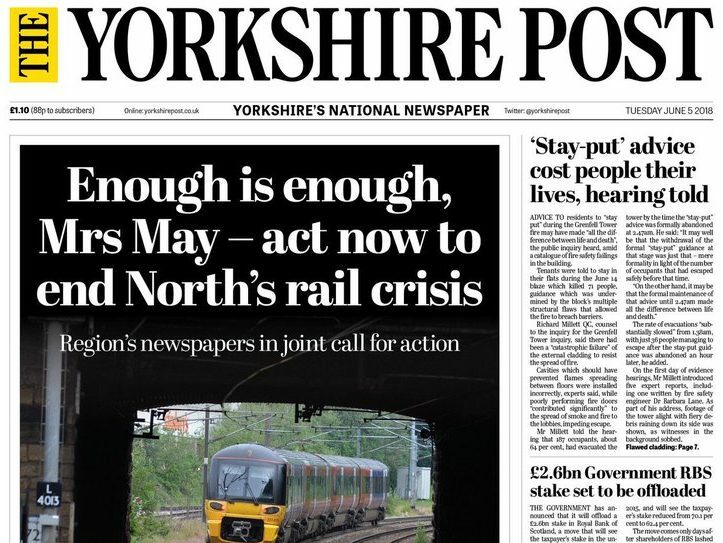 The editor of the Yorkshire Post has said a historic collaboration between the north’s newspapers over the Northern Rail crisis this week came after news groups felt their journalists were not being listened to on the matter. James Mitchinson told Press Gazette the One North campaign, which was published across more than 20 newspapers on Tuesday, was the result of a “perfect storm of frustration”. 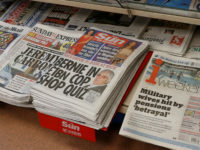 He said the campaign, and its resulting publicity, was the “biggest and best thing” he has achieved in his career to date, but stressed it was all down to teamwork between three newspaper groups: YP publisher Johnston Press, Reach (formerly Trinity Mirror) and Newsquest. The collaboration began with Reach digital editorial strategy director David Higgerson and Newsquest editorial director Toby Granville after it became clear none of their journalists were receiving satisfactory answers from the government over rail disruptions. Thousands of train services in the north have been cancelled since Northern Rail introduced new timetables in mid-May, while hundreds of others have run with shorter carriages. It follows years of “endemic underinvestment” in the north, Mitchinson said. The editors asked themselves “are we being heard?” and decided the answer was “no”, before asking: “What can we do to get heard?” he told Press Gazette. “We just weren’t being listened to. We were all getting frustrated in our own way, trying to elicit answers from government on transport issues. 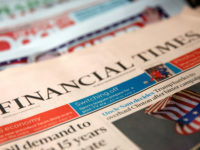 The editors decided to write a single comment piece which could be used across 25 titles, including the Yorkshire Post, Manchester Evening News, Northern Echo, Bradford Telegraph & Argus, The Lancashire Telegraph, The Bolton News, Liverpool Echo, Sheffield Star, Blackpool Gazette, Newcastle Chronicle and Newcastle Journal. They then agreed to publish on Tuesday, with a 10pm embargo on Monday night and a #Onenorth Twitter hashtag so that it gained momentum ahead of an All-Party Parliamentary Group meeting on the issue the same day. Mitchinson said he was delighted that a number of national news outlets picked up on the story. He also did a number of broadcast interviews himself to support the campaign. 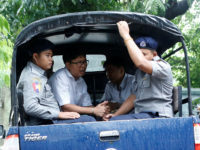 He said the collaboration would continue until there is a “satisfactory resolution”, adding: “It may be the start of a campaign, it may be the start of a concerted relentless drive to get the answers that we want from Government. YP reporters were among those documenting their journeys on railway services through social media on the morning the campaign launched. 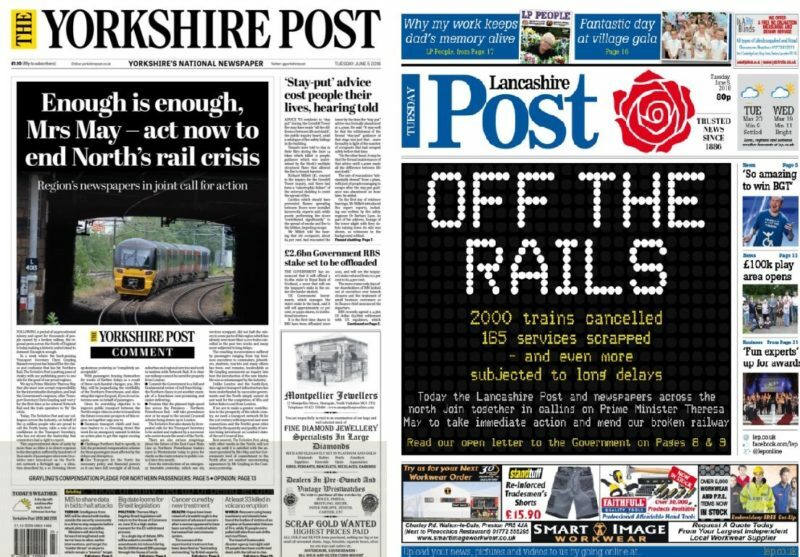 A number of newspapers ran with the headline: “Off the Rails.” The YP said “enough is enough”. A petition set up by the three newspaper groups calling for the Government to “end the Northern Rail nightmare” received 10,000 signatures in just 24 hours. 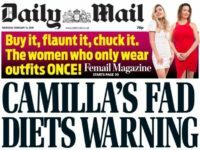 Mitchinson added: “It’s regretful that such large, well respected, historic media organisations – some of the oldest, most trusted news brands in the north – came together basically because we’re so frustrated at not being listened to on our own. “I can honestly say that, when I saw how much publicity we did generate through what we did, I was really really proud and in fact it’s probably the biggest and best thing that I’ve achieved in my career to date. 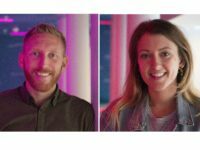 “But I couldn’t have done it without the people here, my team and the teams at Reach and Newsquest.  Granville said: “Our titles at Newsquest were proud to be involved with Johnston Press and Reach for such a major issue affecting so many in our communities. The editors put together a list of five main demands for the Prime Minister, including immediate action to end the Northern Rail crisis, compensation for passengers and fully devolved policy and financial powers for Transport for the North, bringing it into line with London. There was also a joint call to table a vote of no confidence in Transport Secretary Chris Grayling, with the YP going further by repeating its calls for him to resign. In May 2017 Grayling told reporters during a visit to Wakefield station that his department would “endeavour to keep our promises” on the electrification of the Midland Mainline. However the Yorkshire Post recently discovered a National Audit Office report which suggested Grayling knew the plan would be cancelled two months earlier, in March 2017. Mitchinson said Grayling “either knew about [it] and was being completely disingenuous on the platform in May two or three months later, or he knew nothing about them, in which case he’s got absolutely no control over his department”. In August last year, Grayling wrote a column for the Yorkshire Post in which he said transport in the north “must be designed and managed by the North itself”. 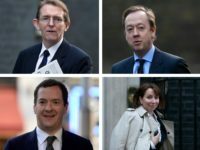 Mitchinson said: “Since then I, as editor of the Yorkshire Post, have lost faith in his leadership and have begun to ask more and more questions via my team. “I’ve used the Yorkshire Post journalists to continue to hold the Transport Secretary and his department to account, quite fairly, it has to be said. “But we’ve reached a point here where the Yorkshire Post has decided – not lightly, it has to be said, because it’s not something which newspapers should do lightly – but we’ve called for him to resign, for him to step aside and let somebody else do the job. In response to a question from Conservative MP Theresa Villiers over the “appalling delays” on the Great Northern line at Prime Minister’s Questions today, Theresa May said: “I absolutely recognise the problem that passengers have faced. “Shorter carriages”, PG? You obviously have no knowledge of railways. Carriages on most day-to-day trains are the same size – indeed, the very same ones – day-in, day-out. What you really meant to say is that they are ‘shorter trains’, made up of fewer carriages.